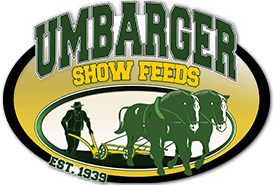 Designed to deliver unique ingredients that will give your animals extra body and dimension needed to succeed in today’s show ring. The first ration to offer spelts as a main ingredient. It’s unique fiber profile is intended to maximize rib shape, depth of flank, and total body capacity. Also includes Umbarger’s APEX for additional gut fill and body capacity. This will give you the full “show day look” everyday. A complete feed for heifers and steers. Feed as the sole grain ration, along with hay of choice. Free choice mineral and clean, fresh water should be made available at all times. Steam flaked corn, steam flaked oats, spelts, grain by products, steam flaked barley, cottonseed hulsl, linseed meal, soybean meal, canola meal, wheat middlings, sunflower meal, corn distillers grains, heat processed soybeans, salt, calcium carbonate, sodium bentonite, monocalcium phosphate, dicalcium phosphate, cane molasses, ferrous sulfate, zinc sulfate, calcium iodate, cobalt carbonate, zinc oxide, manganous oxide, copper sulfate, ethylenediamine dihydriodide, sodium selenite, magnesium oxide, vitamin A acetate, vitamin D supplement, vitamin E supplement, menadione dimethylpyrimidinol bisulfite (source of vitamin K activity), thiamine mononitrate, riboflavin, calcium pantothenate, niacin, vitamin B12 supplement, choline chloride, manganese sulfate, cobalt sulfate, dried Aspergillus Oryzae fermentation extract, potassium chloride, zinc proteinate, potassium sulfate, manganese proteinate, yeast culture, thiamine, hydrochloride, copper proteinate, brewers dried yeast, dried saccharomyces cerevisiase fermentation soluble, propionic acid, water, ammonium hydroxide, sorbic acid, benzoic acid, phosphoric acid, propylparaben methylparaben, and BHA.